I don’t generally write much about myself or a client, but this cake and it’s story is unique and very dear to my heart. Recently a couple came to my bakery to inquire about a wedding cake. Such a lovely couple. They requested a rustic cake with burlap ribbon and flowers. I knew right away it was going to be a country wedding. Then we discussed the groom’s cake, a beaver. I noticed a slight smile cross the bride’s face, indicating a story was behind the cake. So…I asked. The bride proceeded to tell me that they “lived close to town, but out of the way”. That description felt familiar to me. Then she said they had lakes and a beaver terrorized them, building dams and clogging the drain. That also felt familiar. I instinctively said, “you live in my old house! You live on (road name removed for privacy)!” Shocked, the bride asked how I knew that. I told her my grandpa had built the lakes and the beautiful two story log cabin. My grandparents raised me and my brother there. My grandpa had since passed and my grandma moved away. I immediately teared up. My grandpa had been on my mind a lot. I had been missing “home”. Throughout the conversation, we exchanged some stories of what we loved so much about the property. one story being that I, myself was married on the property in 2001. I was also fortunate to live there for 2yrs with my boys, watching over the property, while my grandparents lived in Brat, Fl. They got to experience some of the same things I did in my childhood. I was invited to visit anytime, which is so appreciated. I’m reminded that God answers, even when we don’t know we asked for something. The couple said, “I do!” on Saturday, October 21st, 2017, just a few days before the 5th anniversary of my grandfather passing. I know I was meant to make this cake. Just one more memory left for me to cherish. Kyle and Ciara are one of those adorable couples that you just can’t help but like the minute you meet them. Ciara was sick the first time we met, and even though we kept our meeting brief because of this, she was still so cute and sweet and the fact that Kyle loved and took care of her was very apparent. I couldn’t wait to get to make a beautiful wedding and grooms cake for this sweet couple. Their wedding ceremony was going to take place at the beautiful Eden Gardens in Destin, FL with a reception following at a beautiful hotel ballroom. The wedding was very simple and gorgeous; complimenting the enchanting environment with bridesmaid dressed in buttercup yellow with sage green accents. We incorporated this clean lines and beautiful flowers into the cake itself. 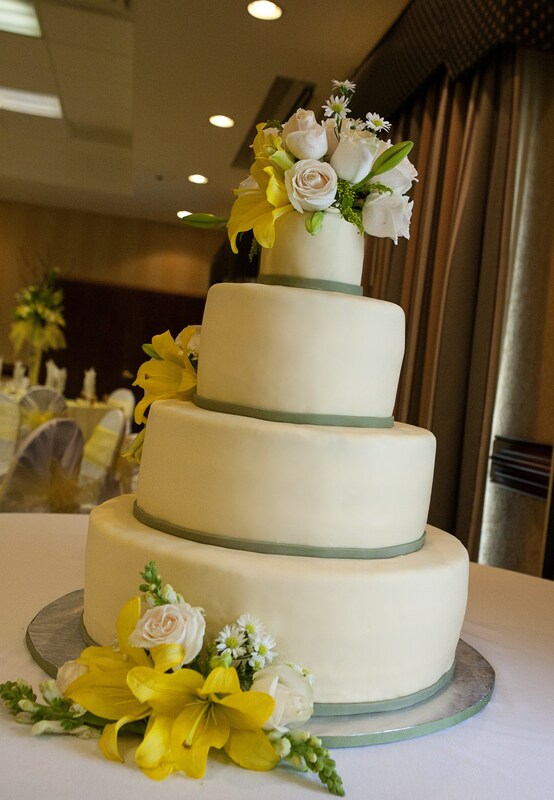 We created a four-tier, round wedding cake in buttercup yellow with a simple sage green, fondant ribbon accent. We added beautiful flowers provided by Uniquely Created Interior and Floral Designs that made the cake absolutely stunning. A simply beautiful masterpiece indeed. A delicious masterpiece too–triple chocolate cake with vanilla buttercream and marshmallow fondant! So yummy! If you were paying attention at the beginning you noticed that I mentioned that I was making a groom’s cake for the lovely couple. What a fun groom’s cake it was, too! The only guidance that they gave was that they wanted it to be a Spiderman themed cake. 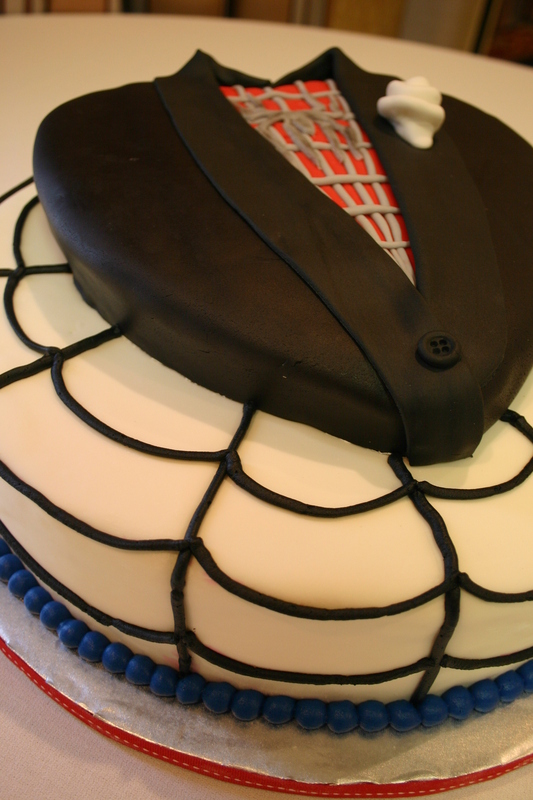 So since it was a formal affair, I decided to make a heart-shaped cake that looked like a tuxedo, but instead of the usual button-up shirt, there was Spiderman’s costume. It sat on a spiderweb cake. It turned out so cute, and was a delicious golden butter cake with vanilla buttercream and marshmallow fondant.